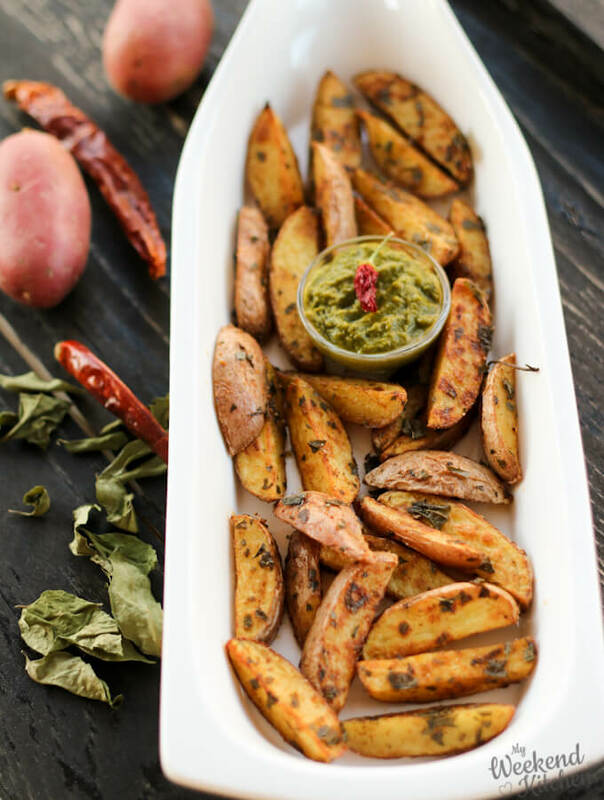 Crispy and delicious, these oven roasted potato wedges are rubbed with an Indian spice mix and roasted with aromatic curry leaves. 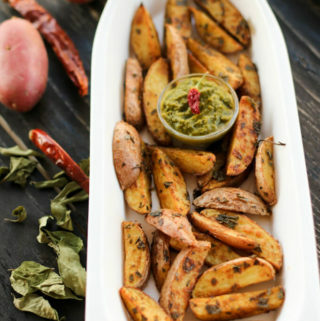 Swap your regular fries or wedges with these for a delightful change. Potatoes and I have had a pretty rocky love-hate relationship. I love them but then I listen to all those health freaks who shout about the carbs loaded in potatoes and I unsuccessfully “try” to hate them. And then I learned the middle path :-). Moderation is the key and also variety. There are so many varieties of potatoes to choose from that we don’t have to stick with just the white potato for most dishes. For these wedges, I have used red potatoes with their skin on. The potato wedges not only look beautiful with the skin, the bright colored skin also adds a lot of fiber to the snack. In many traditional recipes, I replace white potato with sweet potatoes like the sweet potato and peas vegetable fry or the sweet potato salad. In some recipes, I use a mix of sweet and white potato, while in some recipes, I stick with the traditional white potato like the Indian aloo paratha or bread roll. It is not that potatoes need to be absolutely banished if we are talking of healthy food. We need to find a balance. First, we do need carbs in a balanced meal and second, while we cry starch and carbohydrates when we think of potatoes, potatoes actually have many nutrients. 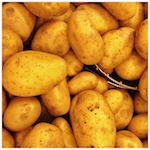 Potatoes start to become unhealthy when they are cooked in loads of oil with loads of salt. The day potatoes turned into fries, they were almost ruling the food scene. There are fries and wedges with everything, inside or alongside every dish. Most of the store-bought wedges or the packs of frozen wedges that one finds at the supermarket are loaded with salt and additives, flavoring agents and chemicals that one can’t even recognize. It is when we mindlessly consume such food that it becomes harmful. When cooked at home with real ingredients, every vegetable is healthy. I have to confess that I can’t do away with potatoes, especially potato wedges and fries but I can make sure I cook them at home with the ingredients I know. 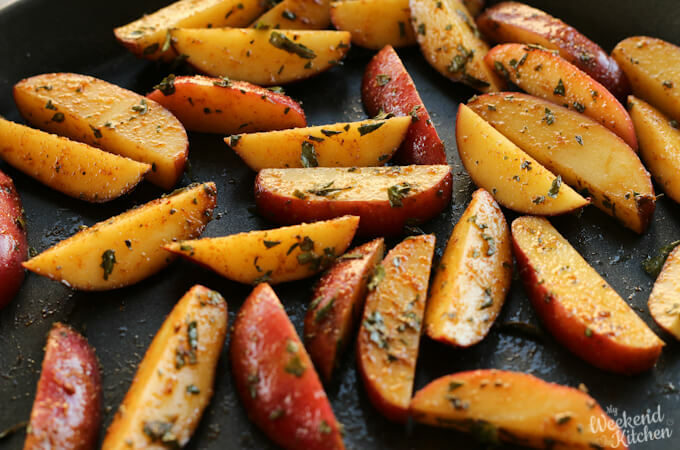 These wedges are roasted with just a drizzle of olive oil and not deep fried. Also making your own wedges gives you the space to experiment with your own flavors! Here I’ve used garam masala and cumin with curry leaves; you can also try some zesty lemon seasoning. Turn on the oven grill. If you don’t have a grill, you can also simply pan-roast the potato wedges on stove-top. Wash the potatoes under running water to remove all the dirt and pat dry. Cut them into wedges or sticks. I used small potatoes so I got 4-6 wedges from each potato. Place the potato wedges in a mixing bowl. Add oil, crushed curry leaves, cumin, garam masala, and salt. Toss everything to coat the wedges in the spices. Spread them on a baking tray and grill. Turn them over after 5-6 minutes. Grill for about 10-15 minutes total, till the skin is wrinkled and the potatoes are soft. Serve with tomato ketchup, coriander, and mint chutney, or any other dip. yummy, delicious. I love this recipe. Oven roasted potato wedges look so gorgeous. Fantastic share. I love potato wedges better than finger chips. These look absolutely delish. And good to know about the nutrients in potato, we love potatoes. This has been on my “To Do” list since a long time. So delicious and everybody’s favourite. What a burst of flavors, Indian spices along with the curry leaves. Home made wedges are the best as I don’t trust the kind of fat frozen ones may have used. A healthy treat for kids too. Potato wedges are favorite of my family. I keep making it often. 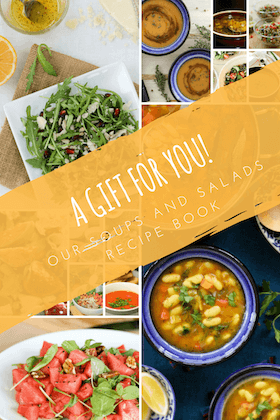 Your baked version is a healthy and awesome idea. Now I know what to do when making them.